Home » Events » DCA Festival of Holidays! Written by: JediJondee46 on January 5, 2018. The DCA entrance themed to Festival of Holidays. Photo by the author. 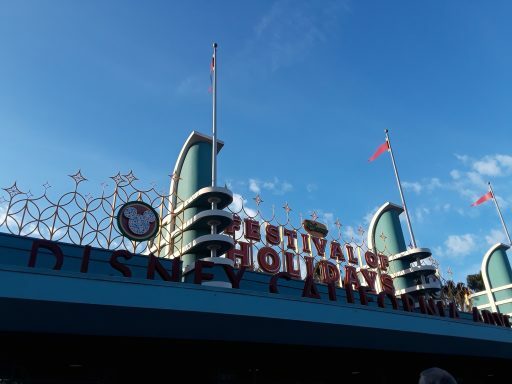 Festival of Holidays is an event at Disney’s California Adventure which begun on November 10th and will end on January 7th, this upcoming Sunday! I wanted to start off the new year catching the celebration before it finished. There is kiosks of delicious food, incredible performances by groups like Mostly Kosher and Mariachi Divas, and tables for crafting holiday items. I really wasn’t there for rides. I did get there at park opening to immediately ride Soarin’ Around the World, walked onto the Little Mermaid Ariel’s Undersea Adventure, and then waited in the line for Toy Story Midway Mania! before 10:30. The lines were hours long after that point. I was really there for the shows and food that were special for the celebration. A few tips before we move on. The sun is blinding so you will need a hat to take pics, I was shooting blind most of the time, sun glare in the pics is no accident. The other is the Fuel rod, I went to the park with a half charge on my phone so taking the pics would drain my battery by the afternoon. The Fuel rod is a charger that you can replace at stations around the park for free after paying the initial fee. Finding schedules, there are posted times, brochures, and of course cast members to help you out. Of course there are crowds at Disney parks, deal with it. Lastly, of course stay hydrated with the heat and find time to get some rest. There are twelve kiosks spread across Festival Corridor facing Paradise Pier from the edge of Bugs Land to Paradise Gardens plus one area at the Paradise Garden Grill. The park opened at 8 a.m. and the festival began at 10:30 a.m. There were two booths I visited Winter Sliderland and Blissfully Braised. 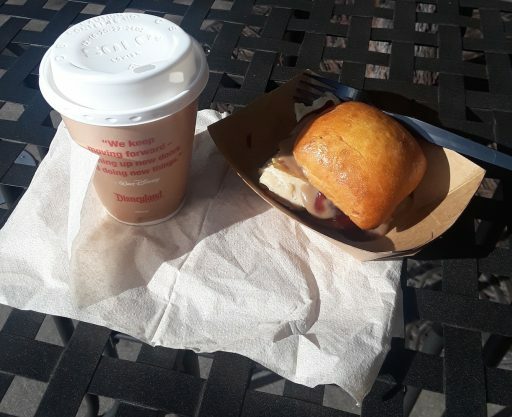 At the first one, I had the Roasted Turkey Slider with cranberry sauce and Ghiradelli White Hot Chocolate with house-made cinnamon marshmallow. The hot chocolate blew my mind, worth double the price, it transported me into a world of chocolate happiness. I later got another hot chocolate and for dessert an Eggnog Macaron. It was two soft cookie-like biscuits with an eggnog filling. At the second kiosk, I got a mint tea (twice) and Braised Pork Belly Adobo with garlic fried rice. I was left with two questions; why the park doesn’t make these part of the regular menu or keep the booths and second, why with these delicious offerings, some people were buying hot dogs at the same price. You could get a passport to try food from different booths and they offered alcoholic drinks at some of the kiosks. Hot chocolate and turkey slider. Photo by the author. Next, the shows, there is something constantly going on at the Festival of Holidays, I went along the food kiosks and then saw the Holiday Toy Drummers so followed them back to the Paradise Pier Obelisk, you can tell exactly where it is since there are figures of toy drummers there. The drummers have a funny, talented performance including “March of the Wooden Soldiers.” It reminded me of the incredible blast! show that was at the theater that now has Frozen. The major reason why I went to DCA was to catch Mostly Kosher. They are a contemporary band that mixes Klezmer with other musical genres like Latin and Hi-Hop. I saw their Festival of Holidays videos on youtube and found them to be great performers that really put on a live show. Mostly Kosher gives you a taste of the Hanukkah traditions, but also the Klezmer music. I have one of the songs from the show, “Ikh Hob Dikh Tsufil Lib” (I love You Much Too Much) from their self titled album on my iTunes playlist. Also there was the Blue13 Dance Company showing the energetic Bollywood dances in honor of Dwali, the festival of lights celebrated in India and all over in autumn. I was stunned by the performance of the Mariachi Divas. Their two time Grammy win seems like only a start for their talent. It was teased that they would play a song from a movie out in theaters, everyone including myself was thinking it was Coco, and then they go into the theme from Star Wars. I hope they are able to enter the Disney fold with movie soundtracks, on the Elena of Avalor show, and I really, really want a Mariachi Diva album of Disney songs. I would hope everyone goes to see the Mariachi Divas at the Festival of Holidays or other venue. Speaking of Elena, outside of Paradise Gardens, there was Princess Elena’s Musical Grand Arrival with a float featuring her jaquin, winged jaguar, and dancers. She sings about holiday traditions. There is also the ¡Viva Navidad! parade that features the Three Caballeros; Panchito Pistoles, José Carioca, and Donald Duck. There are street folkorico and samba dancers. I liked that Mickey and Minnie are biked in at the end. It’s all about the Three Caballeros! I was stunned to see the Three Caballeros at a photo op at the Paradise Gardens since I haven’t seen them in the parks. 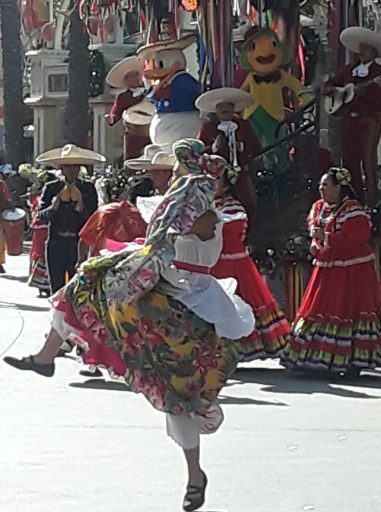 They were playing around when I tried to take a shot of them, the rooster Panchito threw out his arms to block Donald! ¡Viva Navidad! parade! Photo by the author. The Coco preview had figures of Miguel, Dante, and Hector outside of the It’s Tough to be a Bug theater. Down into the roots of the theater is the ofrenda of Ernesto de la Cruz and explanations of the set up of the film. The theater is in 3D so you need glasses. It also uses effects specific to the theater; blasts of air when Miguel makes contact with ghosts, there is crawling underneath you with the bones slipping past, and droplets of water hit you from Dante’s slobber! There were holiday decorations at Cars Land called Season’s Speedings. A snow car had a traffic cone nose at the billboard at the entrance to the land. Some of the rides were re-themed for the holidays like Luigi’s Joy to there Whirl. There were Christmas decorations like the Horn-O-Plenty and tires along with other car parts to make Christmas trees. The last reason why I wanted to go to DCA was to see Paradise Pier before it is given the Pixar Pier changes in the summer. This also gave me an opportunity to play the boardwalk games. You buy a game card and then slide it to play the various games. The baseball game is difficult! I did better with the fishing game where every game is a win! I built up a whole aquarium of stuffies! There is a certain charm to the California theme to Paradise Pier and I hope some of it is kept in Pixar Pier. If you can’t make it to the Festival of Holidays this weekend, keep it mind for the end of this year! Ernesto de la Cruz ofrenda!